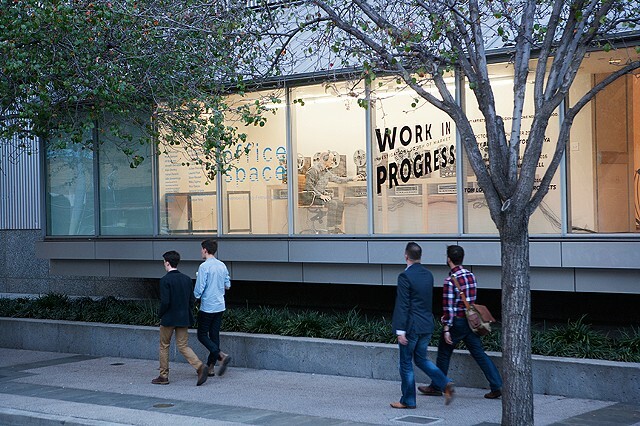 YBCA commissioned a piece examining SOMA, the San Francisco neighborhood where the museum is located. Six pirate FM radio stations were created to transmit the ambient sounds from SOMA locations including a restaurant, a loading dock, a public plaza, and an SRO hotel room. Six vintage FM receivers were placed in the gallery, and the incoming signals were recorded onto six vintage reel to reel tape decks. The erase heads on the decks were disabled, so each day's ambient sound was recorded on top of every previous day's sound. This process was continued for a month. Visitors to the gallery could listen to the layered audio from all six channels. People passing by the museum on the street could observe the artist adjusting and maintaining the recording equipment for the duration of the piece.